Bet Mar Liquid Hobby Shop: Clone Brews, 2nd ed. Clone Brews, 2nd ed. Brew beer at home that tastes like your favorite brand. 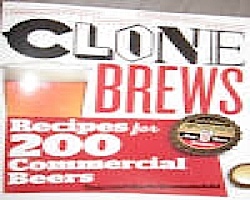 A collection of 200 "cloned" recipes for premium beer from around the world. 439 pages.